U.S Treasury Department announced sanctions against 8 North Korean banks and 26 representatives linked to North Korean financial networks. On Tuesday, Sept. 26, the U.S imposed additional economic sanctions against the 8 North Korean banks and 26 representatives. This is the series of the 5th sanctions imposed by Trump administration against the nuclear weapons and ballistic missile programs of North Korea. The sanction aims to freeze any property and interests of the banks and persons within the U.S territory or in the possession or control of U.S. As a result, the action will block U.S dollar transactions which would possibly flow into the regime’s development of nuclear weapons and ballistic missiles. 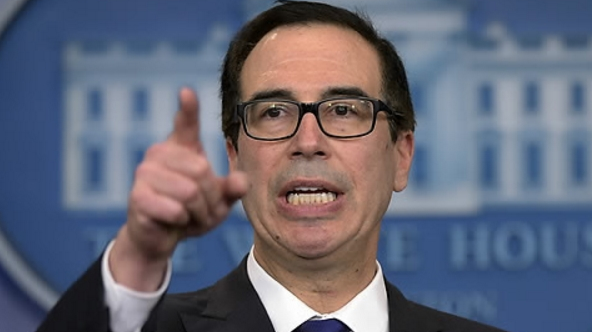 "We are targeting North Korean banks and financial facilitators acting as representatives for North Korean banks across the globe," Treasury Secretary Steven Mnuchin said on Sept. 26 in a statement. “This further advances our strategy to fully isolate North Korea in order to achieve our broader objectives of a peaceful and denuclearized Korean peninsula. This action is also consistent with UN Security Council Resolutions,” he announced. The designated eight banks are: Agricultural Development Bank, Cheil Credit Bank, Hana Banking Corp. Ltd., International Industrial Development Bank, Jinmyong Joint Bank, Jinsong Joint Bank, Koryo Commercial Bank Ltd. and Ryugyong Commercial Bank. The 26 persons are all North Korean nationals working as representatives of North Korean banks overseas such as in China, Russia, Libya and the United Arab Emirates, the department said. The sanctions imposed by the Treasury Department is to complement UNSCR 2375, which was adopted unanimously by the United Nations Security Council on September 11, 2017.